New paper in Nature on ocean cycles finally causes recognition in media | Watts Up With That? Our sceptical connection in Germany, Pierre Gosselin, has taken notice of an article in Der Spiegel that speaks of the link to ocean cycles for climate. Of course we’ve known this for some time, but like with the New Scientist catching up to solar recognition, the previous denial of natural variability in climate seems to be weakening. BTW if you want to track the status of ocean cycles, our WUWT ENSO/Sea Level/Sea Surface Temperature Page has a lot to offer. Right now the Niño 3.4 index continues to drop, and looks to rival 2008’s plunge. Alex Bojanowski at Germany’s online Der Spiegel reports here on a new paper appearing in Nature that shows climate change in the 1970s was caused by ocean cooling. Climate simulation models once indicated that the cooling in the 1970s was due to sun-reflecting sulfur particles, emitted by industry. But now evidence points to the oceans. I don’t know why this is news for the authors of the paper. Ocean cycles are well-known to all other scientists. The following graphic shows the AMO 60-year cycle, which is now about to head south. Now it turns out that the theory is incomplete. A sudden cooling of the oceans in the northern hemisphere played the decisive role in the drop of air temperatures. A huge amount of energy was taken out of the oceans. The scientists said that it was surprising that the cooling was so fast. Huge amounts of melt water from Greenland’s glaciers poured into the Atlantic at the end of the 1960s, and formed a cover over the ocean. The melt water cooled the ocean for one thing, and acted to brake the Golf Stream, which transports warm water from the tropics and delivers it to the north. The result: the air also cools down. The scientists will have to refine their climate simulations. The new study shows one thing: The influence of the oceans is greater than previously thought. September 25, 2010 in Oceans. There is a natural source for the Atlantic and Pacific quasi-cycles but they are not synchronised with each other, or with the solar cycles either. they admit both the oceans and the sun…have an effect on the planet. I need a Bex and a cuppa.. The modelers will just replace the aerosol cooling algorithms with some new ocean cooling algorithms, and hey presto! the late 20th century warming is recreated. “The Golf Stream” – thats a new one. Is that the one that brings all those golf balls from Florida to the beaches of Western Europe? I don’t say ‘Hooray’ the climate consensus is starting to get it. The climate consensus is starting to steal it! We need a sang froid accounting of who we should be thanking for these new discoveries – don’t forget, if they are not in peer-reviewed journals they are fair game for the plagiarists. Phil Jones has been gradually getting his feathers cleaned of CAGW sludge and will be preening and spreading his wings once again. I note he is the 4th author behind a string of newbies. Watch him move up and start presenting more “sceptical science” and also watch is biography development into the vanguard of the new climate science. you wrote that ocean cycles finally causes recognition in media. But you don’t live in Germany and you perhaps don’t know that the German government depends on the industrial lobby. That Greenland melt water sounds like fiction. Want to be that human soot will be blamed for that? You see, there’s a new ice age coming, and wouldn’t ya know it, profitable industry is responsible and must be stopped. I am thinking of all the people who have been saying this exact same thing for the last 10 to 20 years (Prof. Bill Gray leading the pack) and how much they have been vilified for speaking the obvious truth. God bless them all! Still, there is a lot of spin at play in the above article. This statement: “Climate simulation models once indicated that the cooling in the 1970s was due to sun-reflecting sulfur particles, emitted by industry. But now evidence points to the oceans.” is simply a lie. The sulfur particle theory was never “indicated” by the models. It was an extremely poor assumption forced into the models to take natural climate variability out of the man-made global warming equation. It was a con; a ruse. There was never any evidence for it and the fact that the ‘sulfur free’ Southern Hemisphere cooled in lock step with the north, was very strong evidence against it. This article makes it sound like the models were to blame for throwing us of the scientific track. Models are the innocent pawns of the modelers. The sulfur particle theory was a deliberate attempt to derail climate science in favor of environmental activism. And the claimed effects of anthropomorphic CO2 that were so robust are now what exactly? The idea that man’s emissions of CO2 can not influence the climate is making a comeback, after years of sceptical vilification, thanks to major advances in our understanding of the atmosphere. Oops, scientific vilification! Although vilification of sceptics also applies. Taking this thread with the earlier one about solar effects I see complete vindication for my oft expressed view that the observed climate is a consequence of a complex interplay between top down solar effects and bottom up oceanic effects with the latitudinal position of all the air circulation systems shifting as necessary to try and retain equilibrium between those two forcings. I am not aware of any recorded or observed climate change anywhere on Earth that cannot be explained by a simple change of a location’s geographical position in relation to the nearest components of the global air circulation system. “Unfortunately we know too little about the flow of ocean currents and the thermal behaviour of the oceans to be able to draw any helpful conclusions from oceanic features. I have my own theory on that point which I’ve expressed in my earlier articles so that it may be possible to use the more recently discovered decadal oceanic oscillations as a diagnostic tool but this article is about weather so I will leave the oceans to one side in this article. We have to look at the flow of air in the atmosphere to see if we can find anything that helps. The most noticeable airflow phenomenon in the atmosphere is the jet stream. It guides the movement of mid latitude depressions and effectively marks an interface between warmer equatorial air and colder polar air. The intensity of the flow affects the depth and speed of the depressions and the speeds of the winds around them. The reason, and only reason, why AGW now say sun and ocean cycles do have an impact on climate are because they need it to defend the lack of CO2 heating. If the global temperature goes up is it because of increased CO2. If the temperature goes down is it because of natural reason as solar and ocean cycles. As usual Der Speigal misses the point of the paper, and their claim: “The influence of the oceans is greater than previously thought.” are without merit if one actually reads the paper. The opening paragraph the paper discusses the significant influence ENSO in particular has on the exchange of heat between the atmosphere and the ocean. The facts that SSTs influence global temps, and that there are oscilations in SSTs are givens by the authors, and have been well established in the literature. The point is the SST anomoly itself that is not explained by oscilations. Just like what’s happening now only squeezed into 3 years. Let’s hear it for the Gurus and mucky-mucks , for recognizing reality, at long last . Just remember folks, when you say something it is anti-science skepticism. Not quite. The Golf Stream is what brings golfing weather to Northern Europe. Without it Scotsmen would have had to discover fluorescent orange balls before they could invent the sport. Well, “the influence of the oceans is greater than previously thought” by ‘climate scientists’, perhaps, but most of us here on WUWT have known this all along. No, that is not the point. The SST anomaly you are referring to took place from 1968 to 1972 and may very well be a part of the larger ocean oscillations. That singular event is certainly not responsible for the mid-20th Century cooling that started decades before. While the paper may want to extract that singular event from the decadal oscillations, they do so only with a magic wand. Natural oscillations are rarely smooth transitions. One can not look at the gradual temperature decline from summer to winter and exclude a strong fall cold front and proclaim that it is separate from the annual oscillation. Likewise, proclaiming that a sudden drop in the SST of the Northern Hemisphere is not part of the larger, recognized oscillations is arbitrary. Nonetheless, the most important point here remains the fact that sulfur aerosols are not responsible for the mid-20th Century cooling. The oceans are responsible. Which means that the oceans have a larger impact on global surface temperatures than increasing CO2. There is no other conclusion possible and the models must be re-initialized with a climate sensitivity to CO2 much below the current value. That is the significance of the study! Wow! Tells me something WUWT has been on to for years. It’s about time! Better late than never, I always say. So, who are the “denialists” now? Gee, Phil D. Jones, what did you know and when did you know it? What took you so long to tell the rest of us? Ah, that silly old GCM warming output from those hot mega-processor banks, that’s whut dunnit. Better late than never, still. Now, if a cooling AMO will slow down the Gulf Current, so too will a cooing PDO slow down the Japan Current. So let’s see a similar graph of the PDO just below the AMO, and that should tell us how much lag is in the lockstep gait. Anybody else thinking that the “CO2 must explain everything” mentality which has afflicted most climatologists since the early 90’s has set the whole science back about 20 years ? They remind me of the 14th & 15th century astronomers who devised all sorts of weird and wonderful plenetary orbits to corroborate observations with the article of faith that the Earth was the centre of the Universe. Can somebody PLEASE step forward and play the role of modern-day Copernicus.. It is interesting to me that the 1970 sunspot max was something of a wimp in comparison to the ones surrounding it. I wonder how much of a pile on effect that caused? 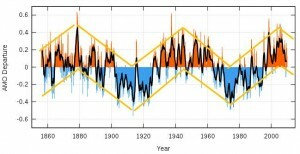 What caused the ocean temperatures to match sunspot cycle strengths? Since when did AGW theory say that sun and ocean cycles had no impact on climate? Seems like the theory has always acknowledged those impacts but they maintained it wasn’t sufficient to explain the warming and GHGs were needed to explain the warming. And where is the lack of heating? Uhm- Jim Clark…please read the paper. If you would like to make a comment about the methodology used to remove known cycles by the author please make it. Please also please reread Mr Watt’s original post. It is carefully worded and attacks “the press” He actually makes no claim that scientists themselves have not been aware of the influence of SST cycles on the climate. Since you think the climate models should be reworked because they did not account for influence of a drop in SST in the climate (this is not in evidence in the paper BTW) then shouldn’t one conclude that CO2 sensitivity is actually higher than it has previously appeared? Quite a turnaround for Spiegel. In the past, its environment pages have combined the daffiness of The Guardian with the pompous finger-wagging of the New York Times to make an unlikely kunstform: German High Comedy. and solar influences are seeming to come together..
Jim Clarke says: September 25, 2010 at 8:50 am It was an extremely poor assumption forced into the models to take natural climate variability out of the man-made global warming equation. Exactly! Simulation models rely on facts and fiction. In many engineering simulations assumptions are few and well founded and simulations results are useful. Now in order for simulations to be useful, they must result in some knowledge we did not already know. My question is then whether they assume too much in climate simulation models? While soot and CO2 cannot be predicted, but certainly must be based on empirical observations, I would argue that water vapour feedback, evaporation, precipitation, cloud coverage and ocean cycles should. If we assume too much simulation results will just reflect our assumptions. For Boeing simulations are highly useful because assumptions are few and well founded – CFD has joined the wind tunnel and flight tests as a principal technology for aerodynamic design. Another question is whether it is at all possible to develop a climate model without too many assumptions? Any climetologist that might have this mentality would have to deny the obvious irregularities in the climate record. Please name them so I can write them off also. Most of us have heard or know of oceans and climate 30-60 year cycles. However, few are aware of geomagnetic pulses of similar period. The compiled new declination curve for Munich shows general agreement with previously published curves for London and Paris and allows to detect geomagnetic jerks with a temporal uncertainty of ±10 years. More or less regular impulses, on a decadal time-scale ranging from 30 to 60 years, are identified for most of the time interval 1400–2000, but the century from about 1760 to 1860 seems to be devoid of sudden secular variation changes. This finding by Scientists is truly unexpected and the the case of PDJ, likely unprecedented. Huge amounts of melt water from Greenland’s glaciers poured into the Atlantic at the end of the 1960s, and formed a cover over the ocean. “Probably it was triggered by a long-time [langjähriger] surge of glacial melt from Greenland, the so-called Great Salt Anomaly,” experts said. This is a horrible translation. It leaves stuff out and inserts stuff spuriously. Vermutlich habe ein langjähriger Schub Gletscherschmelze aus Grönland die sogenannte Große Salzanomalie ausgelöst, meinen Experten. A.) The original German does not even mention “at the end of the 1960s” AT ALL. B.) The translation left out the word “Probably.” The expert is speculating, yet this is completely left out of the translation. C.) “Langjähriger means “long-time” – long-year, literally – and this conflicts with the term “surge” (or “thrust”), even though both are in the original. I would suggest “long-term flow,” but that may add a wrong spin to it. D.) No where in this German sentence does it say, “huge amounts.” Perhaps a long-term flow amounts to huge amounts, but that is NOT what the sentence says, taken literally. I am not an expert on German, but have been translating (fairly badly, but getting better) some documents for an existing project. For better or worse, I use Google Translator and then beat the hell out of them till they make decent English sentences. Every day I receive the English version of Der Spiegel online, but this article is not yet translated by them, so I had to do my best with it. If someone else can improve on my translation, it would be appreciated. My main reason for commenting here is that I wonder at this “huge surge of meltwater from Greenland” IN THE LATE 1960s. This was the HEIGHT of the mid-1900s cool-down. WHY would Greenland have had a melt surge??? When will Mann jump on the solar and ocean cycle bandwagon? Unfortunately if any of us are to be taken even half seriously, it is necessary to break through the barrier of ‘academia and peer review’ publishing. Your and my ideas are not exactly on the same lines, but are not necessarily exclusive. You have ‘mechanism’ idea worked out but you lack numerical analysis with a strong correlation. My case appear to be the opposite, lots of ‘numerical’ but as yet no ‘mechanism’. 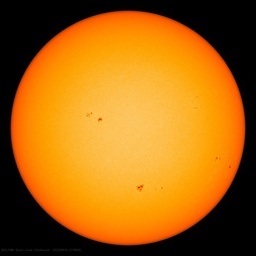 Der Spiegel mentioned sunspot activity at the beginning of an article about a year ago as Climate-Gate reached fruition. Nonetheless, the most important point here remains the fact that sulfur aerosols are not responsible for the mid-20th Century cooling. The oceans are responsible. But what caused the oceans to cool? The sulfur aerosols from industry were not responsible, but bodies of water certainly cool as a result of solar dimming… from volcanic sulfur aerosols? Aerosols, locations and altitudes? Do bodies of water warm from solar brightening? Like when there’s a lack of aerosols? Yes, well, that must be the understatement of the century. Some of you (besides David L) may be interested to note that Michael Mann disagrees with the potential explanation proposed by the paper and thinks the ocean cooling was probably the steep end of a natural climate oscillation spanning several decades. You aint kidding your German aint the best. You’re looking at the wrong paragraph! My translation is fine, your assertion is “daneben”. Yes, just as it was incomplete in 1985-1990, when the consensus was formed, when all these arguments should have been taking place – when the uncertainty, due to massively conflicting evidence, should have been recognized and a way forward should have been determined – IF any direction forward was even needed. If ANY human activity was contributing, it was land use, not CO2. If back then they’d gone in that direction, screamin’ and a-hollerin’, it is entirely possible that no “skeptical” community would ever have formed. Now they are beginning to acknowledge all the doubts they would have heard back then – if they had not excluded other voices from the discourse. And we are all supposed to do what? Praise them? Pat them on the back? Pat them on their wet noses? Give them a doggy biscuit? Scratch them behind the ear? Just for waking up to the obvious? LOL, at least Phil Jones is a bit less slow than before. (But I have to wonder if there wasn’t some kind of “blessing” for the other authors, to have Dr Jones on their paper. I wonder if he did anything other than sprinkle some holy water on it.) But, Hey, Phil, welcome to the sane side of the room! You aint kidding your German aisn’t the best. I was quoting the 2nd to the last paragraph!! You’re talking about a completely different paragraph. My translation is fine. Your accusation is “völlig danaben”. Yes vuk, I’ve noticed that your ideas could fit in with mine because I’ve been leaving space in the description for various components that could be slotted in once evidence becomes available and your suggestions are some amongst several that could fit the bill. As regards beefing up my stuff with numbers and stronger correlations I confirm that I am aware of that weakness but the fact is that the data I need has never been collated and if the professionals have never done it then it’s a bit of a stretch to dump the burden on me. Suffice it to say that I’m content to let ongoing observations confirm or rebut what I say but I must point out that a good deal of new information is fitting in very nicely. I had the same question. Here Der Spiegel seems to be alluding to a possible scenario floated out by Gavin Schmidt. So of course it would make no sense! This Greenland melt surge is just fishing for an expnantion, a refusal to admit the obvious. And if you have to use Google to translate…forget it dude. Unbelievable, but all that fuss was based on 1975-2005 warming trend, indistinguishable from 1910-1940 warming trend, with distinctive cooling trend in between despite the fact, that the composition of atmosphere has changed by 0.003%. Theory about melting Greenland covering the ocean with a layer of cold water is nonsense. The Gulf stream takes all water northwards! How could the cold water layer swim against it to cool tropical Atlantic? There is no other conclusion possible and the models must be re-initialized with a climate sensitivity to CO2 much below the current value. The climate models are not “initialized” with a climate sensitivity. Sensitivity is an OUTPUT of the models. It works like this: you create a physics model to the best of your ability and within computational constraints. You run that model. You vary C02. You then have an estimate for the sensitivity. There are many shortcomings in the models, but “initializing’ with the ‘wrong’ sensitivity is not one of them. sensistivity is not an input parameter. So, there are many things to criticize the models for, suggest that you focus on the real issues. I think both you guys are on to something and I firmly believe we will see more evidence of this soon along with some other things about the sun that have not been explained or known. Each year more and scientific instruments are being used and smarter people are using then and this can only lead to better understanding. Good work to both of you. the model is “sensitive” to the input Co2 value??? How “sensitive” the model is to the input Co2 value seems to me to be what Jim Clarke is questioning – and it seems a reasonable question to me. “Sensitivity” is certainly not an output parameter (whose value depends on the initial settings for the model). It appears to me that Jim Clarke’s statement is perfectly valid and Steven Mosher’s response is a load of codswallop. If the answer is “no”, I can guarantee you that few of the more “respected” folks I knew in academia will be admitting it. Peoples’ lives & families are built on such pillars – and untenable pillars are used where necessary to support what is vital. Many of these characters are formidable and it is incorrect to assume they have no primal instincts about survival & politics. Sure, there are some clowns in academia (just as there certainly are elsewhere) but often it takes only one good leader to guide a group to safety. The climate models are not “initialized” with a climate sensitivity. Sensitivity is an OUTPUT of the models. Sensistivity is not an input parameter. How sure are you about that. The GHG forcing temperature impact in GISS Model E follows a trend which looks very much like a built-in parameterization of 3.0C per doubling (with a lag of 30 years which is exactly the IPCC mean projection). “Obvious conclusion: Trace gas Co2 drives the Arctic climate about as much as a sea breeze drives a loaded freight train”. So what caused the cooling? I mean, natural variability, of course, but what natural variability? Without it Scotsmen would have had to discover fluorescent orange balls before they could invent the sport. If there were no Golf Stream, it wouldn’t have taken them long to discover fluorescent orange balls in those Scottish outfits. First Non Scientist and now Der Spiegel. Ought we to be running odds on which publication makes it a hat trick? Hmmm. Does that mean the science is NOT settled? >>>Now it turns out that the theory is incomplete. If this is an actual global cooling of the seas, that is a heck of a lot of energy disappearing in a couple of decades. And if this is so, then what mechanism re-heats the planet in the following decades? Surely such a massive reheating mechanism aught to be obvious in one record or another. Not saying he has all the answers, but he claims all the variations is possible within this planet itself, without any changes from the sun. “Most of us have heard or know of oceans and climate 30-60 year cycles. “My case appear to be the opposite, lots of ‘numerical’ but as yet no ‘mechanism’”. I’ll give you the mechanism: The planets accelerating the Earth. Because it is moving in an arc the outer parts will accelerate relative to the inner parts, (or is it ‘accelerate relatively to’) i.e. the atmosphere relative to the ocean, the ocean relative to the crust, the crust relative to the core, which alters the magnetism. The same mechanism applies to the Sun, driving the solar cycle, so here you have my ‘unified theory’ for a lot of puzzling things. I am not a scientist. I have a firm belief that anyone who aspires to “model” something so complex and so variable as climate is not a scientist. You just can’t be a scientist and believe in modelling. You just can’t. Sorry. Yell and scream, wave your degrees and your Nobel prize, call me a scientific illiterate (which I am). If you believe in the efficacy of a “climate model” you can’t possibly be a scientist. In fact, you have not yet begun to even think. I guess as sure as several days of going over modelE code can make one. Plus various presentations I’ve read on the matter. I was skeptical so I checked. For a coupled atmosphere-ocean global climate model the climate sensitivity is an emergent property: it is not a model parameter, but rather a result of a combination of model physics and parameters. By contrast, simpler energy-balance models may have climate sensitivity as an explicit paramter. there are real problems with models, but not setting a sensitivity parameter. I think I wrote about this is my comedy sketch ‘George Parr’, which I lodged at this site at the latter stages of Copenhagen 2009. I note the lead author of the Nature paper is from Colorado……………………..
WOW! The Sun, and now the Oceans, influence the relatively thin layer of gasses which encapsulate the planet? *Rolling my eyes* Who’d have thought that eh ? So the Earthshine project first reveals the global albedo effects of the equatorward jets in the 60s when there was some global cooling. Then until the 90s the albedo gradually declined as the jets moved poleward and the troposphere warmed. Then in the late 90s a sudden recovery of albedo as the jets moved equatorward again and I have often said that I noticed that around 2000. Then a few years of stable albedo as the jets hovered around about the same position but I would hazrd a guess that just recently the jets moved even more equatorward and albedo has probably now gone up a bit more but we don’t have the up to date figures yet. I would propose that the jets didn’t move much from 2000 to say 2008 because the residual oceanic effects from the strong late 20th century run of El Ninos were still opposing the tendency of the less active sun to push the jets equatorward.That effect is now fading. Global albedo is closely linked to the latitudinal position of the Earth’s clouds and they are mostly found around the jets and the ITCZ. The ITCZ also seems to move along with the jets. A less active sun pushes the jets equatorward thereby increasing albedo resulting in less energy entering the oceans and net overall cooling. A more active sun allows the jets to move poleward thereby decreasing albedo resulting in more energy entering the oceans and net overall warming. The oceans then vary independently as regards the release of energy to the air and thereby substantially modulate the solar effects sometimes offsetting and sometimes supplementing those solar effects. And all the time the jets are bounced between the solar and oceanic forcings to cause global climate changes. – GISS is increasing at 0.107C per decade since 1975 and 1995. This is about 50% of that predicted by the IPCC (and less than 50% over the last 15 years). One can also see that accounting for the ocean cycles produces a much more accurate hindcast of global temperatures than any climate model has come close to (with no need to build in some assumed aerosol load or even volcanoes which do not have the impact that most assume). Hadcrut3 below (with my forecast going out to May, 2011). I don’t know why I bother! Climate sensitivity is the name the IPCC gives to the models output/result. They could have called it Temperature sensitivity, Factor X, Hussanga or whatever – it’s still a totally dependent variable – a result, which your link maintains is dependent on the values given to the radiative forcing. For a coupled atmosphere-ocean global climate model the climate sensitivity is an emergent property: it is not a model parameter, but rather a result of a combination of model physics and parameters. Steven Mosher, you are either being wiflully disingenuous or you’ve imbided too much of the Kool Aid – you’re certainly not the self-confessed lukewarmer you purport to be. The point being made by Bill Illis and earlier by Jim Clarke, if I am not mistaken, is regarding the “model’s sensitivity” to forcings and feedbacks – not the output/result of the model, which by definition does not affect the model’s sensitivity. Your contribution is an exercise in smoke and mirrors! You don’t need a specific parameter in models for “sensitivity” to control it. All you need is to tweak other parameters until you see a value you think is correct. This is where it is easy for group-think to create a bias in the models. For example, if the “group” think clouds are constant you make them a constant. Now, if heating really does generate more clouds you won’t see any reduction in solar heating and a positive feedback is born. So the Earthshine project first reveals the global high albedo effects of the more equatorward jets from the 60s when the sun was less active during cycle 20 and there was some global cooling. That setup (with less solar irradiance reaching the ground) continued until the late 80s. Any lag between solar recovery and poleward jet shifting would have been due to the residual effects from the earlier negative oceanic phases which I contend operate to sometimes offset solar influences on jetstream positioning. Then for the next ten years until the late 90s albedo gradually declined as the jets moved poleward and the globe warmed with more solar irradiance reaching the ground. Then in the late 90s a sudden recovery of albedo as the jets moved equatorward again and I have often said that I noticed that around 2000. That is when the warming trend seems to have stopped presumably with less solar irradiation reaching the ground again. Then a few years of stable albedo as the jets hovered around about the same position but I would guess that just recently the jets moved even more equatorward due to the recent long solar minimum and albedo has probably now gone up a bit more but we don’t have the up to date figures yet. The outlying FD data is probably a precursor. If we now start to see true cooling I would not be surprised. It is proposed that the jets didn’t move much from 2000 to 2008 because the residual oceanic effects from the strong late 20th century run of El Ninos were still opposing the tendency of the less active sun to push the jets equatorward. That effect is now fading. Global albedo is closely linked to the latitudinal position of the Earth’s clouds and they are mostly found near and along the jets and the ITCZ. The ITCZ also seems to move latitudinally along with the jets. A less active sun somehow pushes the jets equatorward thereby increasing albedo resulting in less energy entering the oceans and net overall cooling. A more active sun somehow allows the jets to move poleward thereby decreasing albedo resulting in more energy entering the oceans and net overall warming. All the time the jets are bounced between the solar and oceanic forcings to cause global climate changes on a region by region basis but the changes in each region are dependent on that region’s location relative to the nearest significant component of the air circulation system. The discussion went like this. Good god. Do you have any idea how far models are apart from each other? and how different they are in their results. Group think would be a much better idea than what is practiced in the field today. And please, boys the models are not tuned and tweaked, except in one very special case. That tuning and tweaking is documented. Its the problem you should be discussing. but no. you make the arguments you are comfortable making. arguments you heard before. arguments the warmists WANT you to make. You’re avoiding the arguments they have amongst themselves. Maybe there is another feedback loop at play here, the public’s skepticism regarding mankind’s effect on climate. Politicians hear from public, scientists hear from politicians, scientists adjust theories to fit in with public views, funding continues. While reading the very fine book “A Commotion in the Blood; Life, death, and the immune system” by Stephen S. Hall, I could not help noticing the connection between research funding, media reporting, and the public’s perception of the ‘war on cancer’. While some researchers are glad to play the public relations game to garner more support for their research, it is a notoriously fickle beast the have around. The same people who try to secure funding through the public, complain about the lack of understanding by the public. Unfortunately, people don’t want to hear about uncertainties from their investments in scientific research. They want to hear certainties, especially when dealing with life and death issues. Unfortunately, for all parties concerned, when approaching complicated topics such as immune systems and climate, you cannot get rid of the uncertainties. This doesn’t stop some from issuing statements containing oversimplifications; they are in the marketing business and know simplified answers are what the public is used to consuming. Al Gore (and others) tried to manipulate public opinion through dramatic graphics and exaggerations. It worked for a while, until people started noticing the falsehoods in his arguments. It would be interesting to see a compilation of the amount of money spent attempting to alter public perceptions of climate change. I wonder how much the warmists have lost in their investments based on the assumption of carbon trading becoming a reality? I wonder how much more money the public is going to lose with windmills, solar energy and other uneconomic forms of alternative energy? Remember, the unspoken motivation for pursuing these expensive subsidies is the idea something needs to be done to ‘save the planet for the children’. Anyway, it is fun to see the turnarounds in thinking regarding natural explanations for climate change, from the AGW crowd, coming on the heels of Al Gore’s complaints regarding the lack of a cap and trade bill from this congress and the drop in carbon futures values. This is all about a shift in the public’s view of climate change. Steven Mosher was right, and deserves credit for trying to correct one of the (many) misconceptions that surface here. One of the frequent comments made at other sites about this place is how hard it is to take WUWT seriously when those who do know what they are talking about, consistently fail to correct the ignorant statements here. This illustrates what a thankless task it is! Obviously variables can be set to influence the output. This, along with different ways the input variables are treated is what accounts for the different climate sensitivity outputs of the different models. If that was indeed Jim’s point then he certainly did not make it clear. This paragraph has several problems with it. First off is that this paper by itself does not prove anything but is merely a jumping off place for further discussion, so to say: “Nonetheless, the most important point here remains the fact that sulfur aerosols are not responsible for the mid-20th Century cooling” is not warrented, as this paper does not prove this as a fact, beyond what the author’s methodology indicates. This is why there is considerable discussion of methodology included with the paper so that others can critique it. “The oceans are responsible” is likewise not a warrented statement. Besides it seems to assume that the ocean’s effects are not already considered in atmosphere-ocean coupled general circulation models. “Which means that the oceans have a larger impact on global surface temperatures than increasing CO2” this statement is completely unsupported by this paper. Most of the discussion around this paper revolvs around the role of arisols vs SSTs. “There is no other conclusion possible and the models must be re-initialized with a climate sensitivity to CO2 much below the current value.” This is actually quite a whopper. How about that the paper’s methodology has errors? Or that some perameter such as arosols is not being addressed correctly by the AOGCGM? As Steven Mosher pointed out there is no CO2 sensativity knob on the programs. Furthermore without knowing how the models responded to this particular bleb it is impossible to know if the models output should be more or less sensative to CO2 or if the sensativity of some other input factor for example arosouls, some quality of clouds or even lapse rates might need adjusting. Many folks here are very quick to jump to conclusions. This is hardly a quality that is compatable with calling onself a skeptic. This paragraph has several problems with it. First off is that this paper by itself does not prove anything but is merely a jumping off place for further discussion, so to say: “Nonetheless, the most important point here remains the fact that sulfur aerosols are not responsible for the mid-20th Century cooling” is not warranted, as this paper does not prove this as a fact, beyond what the author’s methodology indicates. This is why there is considerable discussion of methodology included with the paper so that others can critique it. “The oceans are responsible” is likewise not a warranted statement. Besides it seems to assume that the ocean’s effects are not already considered in atmosphere-ocean coupled general circulation models. “Which means that the oceans have a larger impact on global surface temperatures than increasing CO2” this statement is completely unsupported by this paper. Most of the discussion around this paper revolves around the role of aerosols vs. SSTs. “There is no other conclusion possible and the models must be re-initialized with a climate sensitivity to CO2 much below the current value.” This is actually quite a whopper. How about that the paper’s methodology has errors? Or that some parameter such as aerosols is not being addressed correctly by the AGOG? As Steven Mosher pointed out there is no CO2 sensitivity knob on the programs. Furthermore without knowing how the models responded to this particular bleb it is impossible to know if the models output should be more or less sensitive to CO2 or if the sensitivity of some other input factor for example aerosols, some quality of clouds or even lapse rates might need adjusting. Many folks here are very quick to jump to conclusions. This is hardly a quality that is compatible with calling oneself a skeptic. “If further research helps show that the two events are related, this could provide a way to further test modelled ocean responses to freshwater additions from the Arctic,” says Gavin Schmidt, a climate modeller at the NASA Goddard Institute for Space Studies in New York City. Scientists believe that global warming will increase freshwater flow into the North Atlantic. In other words, a bit of science, dealing with the uncertainty at the advancing front of knowledge. This is good that people are starting to realize the importance of the oceans, and how their is a much stronger correlation between oceans and temperature, then CO2 and temperature. Yuba Yollabolly says: Besides it seems to assume that the ocean’s effects are not already considered in atmosphere-ocean coupled general circulation models. On the other hand, if we assume, for example, that cloud coverage is constant, well, then cloud coverage remains constant, or if water vapour feedback is assumed to be positive, then it remains positive. Now, I have not seen a simulation prediction of AMO, PDO or other ocean cycles. You seem to assume that the ocean’s effects are considered. Please explain. Is it a steady state equilibrium assumption, just like an assumption that the cloud coverage may be constant, or is it a result of the numerical calculations? If ocean’s effects are considered to be constant or input to the model, I honestly think that the modelers should be ashamed. Just like CFD Boeing simulations are able to predict 3D flow transients, ocean’s effects should be a result of, and not an input to, the global climate models. My take is that it impossible. With the available computational recourses a meaningful global climate model simply is impossible. Don’t get me wrong, i have nothing against his efforts. But how in the world can we arrive at a document called “advice for policymakers” with such basics. Even politicians should be able to see how broken this is. Hopefully Cancun will all be bitching and moaning and no results. Wikipdia states: Coupled climate models do not simulate with reasonable accuracy clouds. Thanks. And now you know the power of actually listing to what your opponent has to say and unravelling their position from inside. Either you do not know of what you write or you are being deliberately disingenuous. All global climate models and energy balance models are known to provide indications which are based on the assumed degree of aerosol cooling input to each model as a ‘fiddle factor’ to obtain agreement between past average global temperature and the model’s indications of average global temperature. A decade ago I published a peer-reviewed paper that showed the UK’s Hadley Centre general circulation model (GCM) could not model climate and only obtained agreement between past average global temperature and the model’s indications of average global temperature by forcing the agreement with an input of assumed aerosol cooling. And my paper demonstrated that the assumption of aerosol effects being responsible for the model’s failure was incorrect. (ref. Kiehl JT,Twentieth century climate model response and climate sensitivity. GEOPHYSICAL RESEARCH LETTERS, VOL. 34, L22710, doi:10.1029/2007GL031383, 2007). Kiehl found the same as my paper except that each model used a different aerosol ‘fix’ from every other model. “One curious aspect of this result is that it is also well known [Houghton et al., 2001] that the same models that agree in simulating the anomaly in surface air temperature differ significantly in their predicted climate sensitivity. The cited range in climate sensitivity from a wide collection of models is usually 1.5 to 4.5 deg C for a doubling of CO2, where most global climate models used for climate change studies vary by at least a factor of two in equilibrium sensitivity. The graph has dots all over the place. Radiation physics tells us that additional greenhouse gases will increase the energy content of the atmosphere. Energy content is not necessarily sensible heat. An adequate climate physics, not radiation physics, would tell us how that increased energy content will be distributed among all the climate modes. Additional atmospheric greenhouse gases may heat the atmosphere, may have an undetectable effect on heat content, or may even cause the atmosphere to cool. 4. there is good reason to suppose that they are all wrong because they cannot emulate cloud processes which are not understood. A guest post explaining these statements, would be enlightening to this member of “the great unwashed”. I come here to learn (talk about a free education), but I am disappointed by some of your recent comments. Contempt of ones audience, does not foster communication. Oh well, I sure am glad I stumbled on to WUWT. Steve, i’m a computer programmer, i *like* models. What i always found unprofessional was the importance given to this fledgling science. And when i see entire national governments falling for it i must get the impression that either the politicians are as dumb as a box of soap or they have a hidden agenda. Still don’t know which. But as long as a scientist doesn’t have the attitude of a Mann, Hansen or Schmidt, he’s not my opponent. One can see how sophisticated the climate models are by examining the direct and indirect Aerosols forcing built-into GISS models. These straight lines have the magical property of cancelling out all GHG warming prior to 1970. According to the models, the warming did not really start until 1970 (or 1972 now that the oceans have declined so rapidly). So all those ups and downs from 1880 to 1970 were caused by Solar Forcing or Volcanoes and not GHGs/Aerosols – they completely cancel out. Get off your high horse, Steve. You know as well as I do that there is no way to accurately model climate with the current level of knowledge. If you don’t know this then you need a little education on “elephants”. Since it can’t be precisely modelled then, guess what? Assumptions are made. All I did was demonstrate how a wrong assumption could lead to increased sensitivity without the need for a specific parameter.